Welcome to the updated nickelallergyfree.com! The site is refreshed and relaunched in the WordPress framework. Welcome back! The first step has to be figuring out what you are allergic to. Without this, you will try many options, expend effort, energy and potentially many doctors fees with no results. For contact allergies (with the most common symptom being eczema), the most effective method is the patch test – your dermatologist can test you for allergy to multiple allergens including nickel. Find a good dermatologist – he or she will look at your condition, listed to your experience and recommend next steps – which for a likely contact allergy will include a patch test. This can be the most challenging part of the process. It is also the most rewarding as you make discoveries and see improvements in your skin and a reduction in the itching and scratching. For a nickel allergy, it’s fairly easy to test many of the objects you use in your daily life for the prescence of nickel. For each object you find, replace it, throw it away or give it away as soon as you can! In some situations, the best way to remove the allergen (from contact) will be to use gloves – see my page on “protecting your hands”. This may be the case if you come into contact with nickel outside your home – where you have less control – for example in your job. In addition to removing as much contact with the allergen as possible, as your skin heals you should find a barrier cream which you can use to help keep your skin moisturised and preferably also act as a partial barrier to further occasional nickel contact. (Your dermatologist may recommend steroid cream or ointment to get your skin under control but use of these is not a safe or effective long-term solution). My personal recommendation is Neutrogena hand cream to be used every time you wash your hands. It’s available in miniature tubes as well as the regular size – the miniature tubes are great for keeping in pockets. Keep a tube at work, at home, in the medicine cabinet, in the car. Use it every time you wash your hands to keep them from drying out and to keep that barrier present at all times. No excuses! A note about steroid creams or ointments. Your dermatologist may prescribe steroid cream or ointment to help get a nickel contact allergy under control. In short bursts, steroids can be safe to use but cannot be used continuously. Firstly, your body gets used to the steroid and it becomes less effective. Secondly there can be side-effects from continuous usage. Your dermatologist may prescribe small amounts of steroid to keep handy for potential flare-ups after your exzema is substantially under control. I use lightweight food service gloves to protect my hands for numerous chores. These are fairly easy to get hold of if you know where to look… Costco have them in handy boxes which can be stashed around the house for easy access. I recommend you try more than one type before settling down on a regular purchase. Rite-Aid carry a selection of different types of gloves. I settled on nitrile gloves because they don’t contain latex – since I’m also mildly allergic to latex and don’t want to make it worse… think first before using latex gloves regularly – you may also add a latex allergy to your woes. I use gloves without powder since I’ve found that bothers my hands. Many metals are alloyed with nickel – alloying improves the properties of the base metal – for example increasing it’s hardness or strength. For example, gold rings made of more pure gold (eg 24 karat) are weaker, softer and easier to scratch and bend than (for example) 9 karat rings. However this alloying can come at a price if you are sensitive to one of the alloying metals. I aim for these pages to help you in your jewelry metal choices and to help you in the decision-making process. You will see, there are no obvious cut-and-dry simple answers when it comes to avoiding nickel in jewelry. Your best friend is accurate information but that this can be difficult to come by. My personal recommendation is that you find a jeweler who you can trust and have them find you gold with zero nickel. Expect to pay more for accurate information – a jeweler who plays fast and loose with purities may not charge as much but you may end up paying the price twice over later on. I couldn’t find a good summary of metals information on the web but did see a lot of assumptions and heresay so I compiled these pages to aid my understanding and hopefully help you too. If you have any comments, additions or corrections, please feel free to contact me. Gold for jewelry is typically measured in karats – karat definitions are as follows. Note that there can be very little gold in your gold ring. The above percentages are by weight – since gold is dense compared to other metals, the by-volume percentages of gold in each karat rating are lower. More information is on Wikipedia. In any case, you can see that most gold jewelry has a significant content of other metals. The crucial issue is then which metals is your gold jewelry alloyed with? Although ‘standard’ yellow gold may be alloyed with with silver and copper, there is almost no limit to the actual content variations in gold. Again, this is where an expert (who cares) can truly make the difference between knowing what you have and ending up with an expensive mistake which causes nothing but aggravation and suffering. White gold is gold alloyed with nickel – which obviously has a potentially high nickel content – although more often than not, “white gold” rings are actually yellow gold plated with Rhodum. The Rhodium wears off in 6 months – 3 years (see below) and needs re-plating. White gold alloyed with nickel is very hard – which makes it much more difficult to ‘work’ into jewelry. Hence white gold is either more expensive than yellow gold… or it isn’t really white gold. Even white gold alloyed with nickel isn’t pure white – again requiring a rhodium plating to make it appear whiter. An alternative alloying method (which is more expensive and hence less common) is with copper, silver and palladium. This produces a purer ‘white’ and therefore doesn’t need rhodium plating to complete the ‘white’ effect. Rhodium plating may be applied to white gold jewelry to enhance it’s shine – and in fact to turn ordinary yellow gold into “white gold”. wear off. Needless to say, I hesitate to recommend white gold to anybody with nickel sensitivity. But which gold has nickel in it? Gold manufacturers publish data sheets which show which alloys are present in their gold. A jeweler who creates brand new jewelry with new gold will be able to tell you exactly what’s in the gold. Some manufacturers will control the gold and the whole process and will document their jewelry as nickel-free. However since nickel labeling is not required in the US, this practice not common yet. In order to find true nickel-free jewelry, you need to find a jeweler or retailer who knows enough about their product and it’s origin to guarantee the nickel content. Jewelers and retailers who specialize in nickel-free jewelry are much more likely to be able to help you since they have already dug through the data to know what they are selling. Do I have a Nickel Allergy? Symptoms of a nickel allergy arise from contact – usually repeated contact with items containing nickel. The most common symptom is chronic itching – itch, itch, itch. The itching is often combined with a red rash, raised bumps and broken skin. Itchy red rash around your belt buckle? Itchy red rash around your watch? Itchy rash on your hands/fingers? Any of these could indicate a nickel allergy. Your dermatologist will be able to perform a patch test to confirm a nickel allergy a patch test contains a set of patches with soluble allergens coated onto a number of seperated patches and placed on a sticky backing sheet. Basically the patch test is placed on your skin (for example on your back) and then left there (possibly for a day or two). A severe reaction to one of the allergens will show up dramatically – often with a raised red itchy patch immediately beneath the test for that allergen. One of the advantages of a patch test is that multiple allergens can be tested together. Your dermatologist will know which patch test to choose – and he/she may use a second test if nothing shows up on the “common allergen” test. There are more detailed tests which carry a larger set of less common allergens and would normally be used if you don’t show an allergic reaction to the first test. Ask your dermatologist for help and advice. One tiny piece of knowledge can make a huge difference – knowing that you are seriously allergic to a substance, food, pet, etc can transform your life. This is because this knowledge allows you to finally make the choices and trade-offs in your life to get rid of the allergen and control your symptoms – be they itching, pain, blemishes, etc. Not sure whether you may have a nickel allergy? If you’re not sure whether you have a nickel allergy, I recommend finding a good dermatologist. 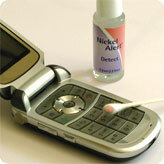 He/she will be able to test you for nickel allergy and other allergies at the same time. The standard nickel allergy (for contact allergy) is a ‘patch test’. A patch test is basically a set of patches which are pressed against your skin and stuck against your skin for 2 days. Each patch includes a form of the allergen (for nickel usually nickel sulphate). If you have a contact allergy to one of the allegens after 2 days the area of skin under that patch will turn red and possibly itch and blister if you have a severe reaction. It’s important not to scratch the test, swim, shower or otherwise get the test wet. If you do the results may well be useless. Ask your dermatologist – he/she will be have access to patch tests and will be able to recommend the route to take. Multiple patch tests are available at different costs and with different sets and numbers of allergens. Typically the first test he/she will use will be a patch test with the most common allergens – nickel usually being one of them. Depending on your symptoms and the results of that first test, your dermatologist may recommend further test to either look for other allergens or narrow down the specific allergen(s) you are having problems with. Patch tests are often placed on the back or on the arm. Be forewarned – it is very likely to itch! If one of the patches causes a severe reaction this is good because you’ve found something you’re severely allergic to however this one will itch itch itch like CRAZY and you’ll be begging the doctor to rip it off. I knew my keys were a problem and I keep as few keys as possible on my keyring. I decided to test my remaining keys and keyrings for nickel. three of my keys and one of my keyrings tested positive (showed pink on the test). The bottle opener was aluminium so that tested negative. I’ve ditched the extra keyring which tested positive but still need the other keys! nickel to my other belongings. Nickel test kits from nonickel.com. Nickel allergy – How do I know whether something has nickel in it? Too many metals are alloyed with nickel – this gives them extra strength but gives the potential for causing or excacerbating a nickel allergy. Even gold often contains nickel – higher karat numbers imply fewer impurities in the gold. “Impurities” in the case of gold simply means other metals alloyed with the gold. The impurities make the gold stronger and more hard wearing and may be used to change it’s color but give the potential for quantities of nickel in continuous contact with the skin (via a ring, necklace, earrings, watch, etc). However the important factor is not actually total nickel content but whether the nickel is “free” – ie is soluble in sweat or other liquids. It the nickel is chemically bonded such that it won’t come out, it is much less likely to cause a problem. 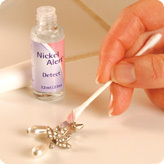 You can find out whether an item has free nickel by using a nickel test kit. Test kits are multi-use, inexpensive, easy to use and can be used to test any metal item with enough surface area to rub the test on. Use it on jewelry, tools, watches, buttons, zippers, coins, etc. The kits are very simple to use – there is one premixed solution which you drop on to (eg) a cotton bud – a few drops. 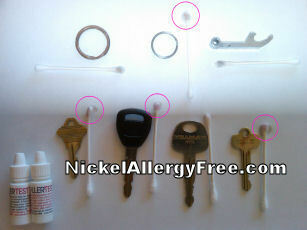 Then rub the wetted end of the cotton bud on the item in question… if free nickel is present, the tip will turn red. Nickel sensitivity symptoms will often get worse (or start) when you get hot and sweaty because it’s the salts in perspiration that carry the nickel through your skin. If the below symptoms occur, you may be allergic to nickel (or potentially another metal – some people are allergic to aluminium or other metals). A rash, itchy patch or redness/soreness which gets worse during the summer months is a good warning sign that sweat is combining with something and causing a reaction. Remember symptoms can get worse and worse if you do nothing – if you don’t find out what you’re reacting to and deal with it. Rash or itching under a bracelet or watch. Rash, itching or redness below a necklace. Rash or itching underneath a trouser (pants) pocket which you typically use to hold keys or coins. Note that the pocket fabric doesn’t protect you from the nickel – I know this first-hand since this was my first symptom of a nickel allergy. This is a classic and common symptom – a rash on your belly – around the top of your jeans. Typically this can be a reaction to nickel in the button or rivet in your jeans. It’s also possible to get a reaction from a belt buckle – particularly if you wear it such that it touches your skin. It’s also possible to get a reaction through a shirt however. Again, a common symptom, redness, itching, soreness, rash or blistering around an ear piercing. This can be the very first symptom of a nickel allergy when you pierce your ears for the first time and don’t ensure that the “healing” post is nickel free. The wound will fail to heal – and just get worse and worse. Flaky skin or blistering next to glasses (spectacle/eyeglasses) frames.